These images, taken with Parker Solar Probe's WISPER inner and outer telescopes, show a view of the universe about 13 degrees off of that seen from Earth. As Parker Solar Probe prepares for an unprecedented close-up of the sun, the new spacecraft sent data home showing that all is well in the mission. 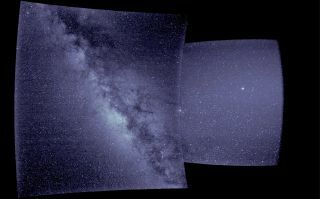 The probe's instruments showed the band of the Milky Way and picked up evidence of the solar wind, the constant stream of particles emanating from the sun. The spacecraft will swoop close to the sun in November of 2018 and, over the course of seven years and many orbits, will take periodic close-ups of the sun and zoom by Venus several times. Parker will come within 4 million miles (6.4 million kilometers) of the sun on its closest orbit; that's more than eight times closer than the planet Mercury gets to the sun. But to investigate that phenomenon, Parker's four instrument suites need to work correctly. Fortunately for mission investigators, the first data sent back in the month after launch shows that everything is working fine. "All instruments returned data that not only serves for calibration but also captures glimpses of what we expect them to measure near the sun to solve the mysteries of the solar atmosphere, the corona," project scientist Nour Raouafi, who is based at the Johns Hopkins University Applied Physics Lab in Maryland, said in a NASA statement. WISPR (Wide-Field Imager for Solar Probe): A new image from the two WISPR telescopes captured a dark portion of the Milky Way galaxy as well as the star Antares, which is in the constellation Scorpius. Eventually, WISPR will send back images of the corona and other parts of the sun's atmosphere. First light from Parker Solar Probe's Integrated Science Investigation of the Sun instrument suite. ISʘIS (Integrated Science Investigation of the Sun): This consists of two instruments that measure high-energy particles associated with activity on the sun, such as solar flares or coronal mass ejections of charged particles. The two instruments picked up cosmic rays (on the higher end of the energy spectrum) that come from outside of the galaxy, as well as hydrogen and helium particles (on the lower end of the energy spectrum). When the instruments are closer to the sun, they will seek evidence of solar energetic particles. Early results from Parker Solar Probe's FIELDS instrument suite showed the signature of a solar flare. FIELDS (Electromagnetic Fields Investigation): This instrument will measure magnetic and electric fields in the sun's atmosphere to help scientists better understand why the corona is so much hotter than the photosphere. The first data that FIELDS sent back was collected when the instrument's antennas, attached to a boom, were deployed, shortly after the spacecraft's launch. Investigators caught a glimpse of the spacecraft's own magnetic field during the deployment; the strength of the field dropped off as the boom extended away from the spacecraft. Parker Solar Probe's SWEAP instrument surprised scientists by picking up evidence of the solar wind (red) shortly after the tool began recording data. SWEAP (Solar Wind Electrons Alphas and Protons): This suite has three instruments: a cup that measures the solar wind and two solar probe analyzers that look at charged particles in that wind. Investigators saw a gust of solar wind blowing into the cup shortly after they first turned on the instrument, even though the orientation of the spacecraft was not expected to yield measurements. Later on, the analyzers examined the solar wind for short periods. You can download all the data from these instruments at this NASA website.